Varsity 2014 saw the launch of Team Southampton, a unified sports community and identity for our sport clubs. Part of the process was to regulate our visual identity through Team Southampton colours for our sports clubs. The Maroon, Gold and Navy will take over Widelane and the Jubilee from now on, but we want it to take over campus! 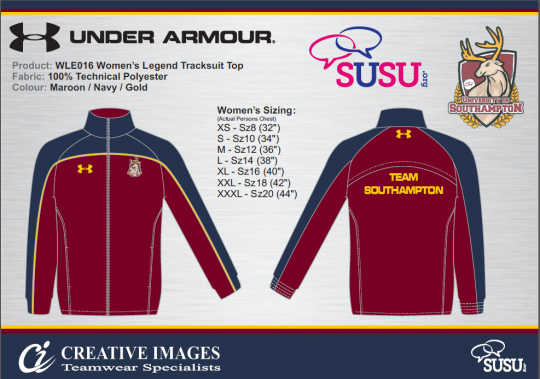 You may have seen Athletic Union Committee members and AU members sporting the new Team Southmapton Under Armour training/ causal wear. We had loads of enquires as to how people could get their hands on some so we have worked on a system to enable people to do so. In July, a Team Southampon shop will go live on the box office and enable you to buy Track Jackets/Bottoms, Hoodies, Vests, Polos, and Tshirts. Orders will be made in bulk so there will be a deadline of August 1st to place your order to ensure that the items arrive in time for Freshers’. One Comment on "Team Southampton Online"
When in July can the new stash be bought? I can’t seem to find a link on the SUSU box office website!